Born as a mechanism to facilitate payment and streamline the transaction process, eWallet grew up into a global connector between retailers and their customers. Discover the secrets of eWallets to understand how the technology works and which benefits it brings to businesses and end users. Imagine standing in a queue at the checkout, being awfully late for an important meeting. How much valuable time can be spent while the cashier asks every customer if they have a card and while you wait for them to identify the right plastics in their wallets. This nightmare has been part of our lives for a long time, but it seems to be turning into fiction with the growth of eWallets. A mobile wallet, or eWallet, is primarily a mechanism to facilitate payment and streamline the whole loyalty transaction process. EWallet application development is based on the use of NFC (near field communication) to process a payment transaction. NFC uses radio waves to exchange information, but it is limited to a very small distance (up to 4 inches or 10 centimeters), hence the name. Today, numerous brands are engaged in eWallet app development. Some digital wallets are free and require just downloading; some are paid and provide extra benefits in addition to storing credit and debit card details. For example, there are eWallets that can hold information on up to 1,500 loyalty programs and let the owner manage their portfolio of loyalty memberships, special offers, and privileges. Customers’ preferences for particular eWallets often originate from the devices they use. For anyone with an iPhone, the choice is fairly obvious: Apple Wallet, which includes Apple Pay. There are several Android options, the most widely used of which is Android Pay from Google, which has similar functionality to Apple Pay. The holders of PayPal accounts can use the PayPal wallet, which runs equally good on iOS, Android, and Windows Phone. Though the PayPal wallet is primarily for online shopping, more and more stores are starting to accept it. 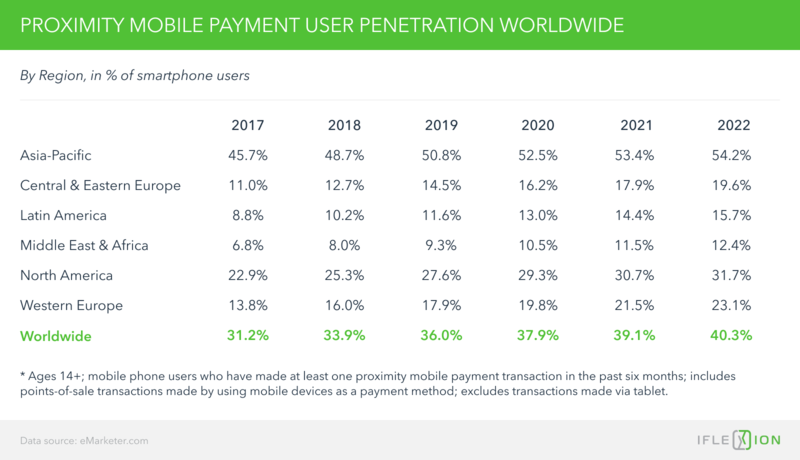 Perhaps for this reason, PayPal wallet became the most popular mobile payment option in 2018, followed by Apple Pay and Visa Checkout. Though mobile wallet application development offers tremendous opportunities for both customers and retailers, their acceptance didn’t take off in the beginning. The tide turned in 2017 when point-of-sale (POS) mobile transactions surpassed 720 million proximity mobile payment users worldwide. Statista forecasts that the growth of mobile payments will reach the mark of 1.1 billion users in 2021. Another study carried out by eMarketer shows that smartphone users are becoming increasingly more engaged in scanning QR codes and using NFC technology to complete transactions. Every year the usage of proximity mobile payment apps grows by 13.5% and is forecast to reach 938.2 million individuals, or 36% of smartphone users in 2019, with further growth to 40.3% by 2022. While we live in a global village, there are some very distinct differences in using mobile wallets, depending on which street you live on and how long you live there. The Asia-Pacific region is the quickest market to adopt mobile wallet development technologies, which means that staying away from NFC is no longer an option for retailers there. At the same time, European and American merchants still have time to consider the needed technological changes — but not that much time, as only the early bird gets the worm. China is the pioneer in the usage of eWallets. According to eMarketer, 81.4% of Chinese smartphone users are estimated to access proximity mobile payment apps in 2019, which is nearly half of the country’s population. The growing user base is, for the most part, the clientele of Ant Financial’s Alipay and WeChat Pay, a built-in element of the widely used mobile messaging service WeChat. Alipay and WeChat Pay have evolved far beyond simple eWallets. In Chinese smart cities, Alipay can be even used for birth and marriage registration. WeChat Pay also offers lifestyle options like flight check-ins. The success of proximity mobile payment adoption in China is explained by the country’s mobile-first culture. The middle class is heavily opening bank accounts at high rates and prefers linking mobile payment accounts rather than signing up for traditional credit cards. This desire for convenience leads to the growth of mobile payments. 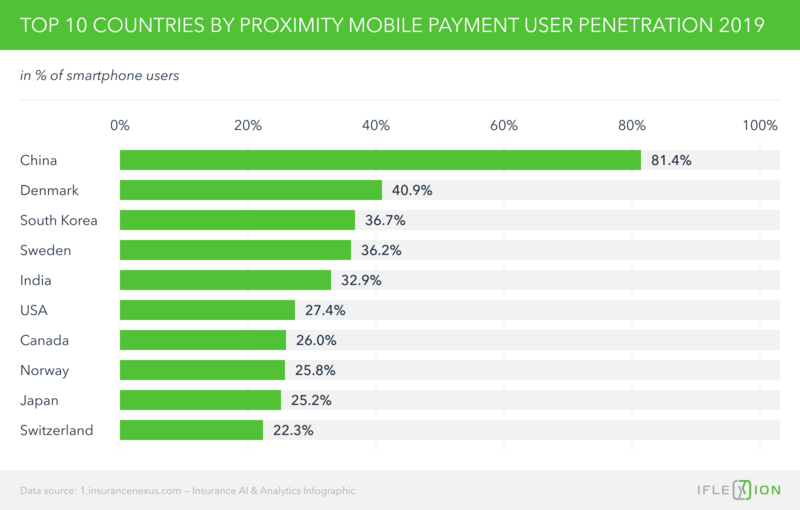 The above graph shows that Germany is the second leader in mobile wallet app development and usage that will continue to grow fast (20.1%) in 2019. Yet in 2016 Aimia in their annual “Loyalty Lens” report named Germany a cash-based society, in which only 4% of respondents actually used a digital wallet, and 75% of the population showed little inclination to use one in the future. So, it looks like a negative attitude to eWallets is not that stable as it seems at first sight. In the turbulent but connected world we live, sentiments can also change rapidly. While Europe, in general, is lagging behind in exchanging their plastic for payment apps, the ease of eWallet use may change some minds. Overall, the top 10 eWallet adopters are likely to become different in 2019. eMarketer predicts that India (26.4%), Indonesia (24.3%), and Mexico (20.3%) will be the fastest growing markets this year. The main driver for eWallets’ popularity is the focus on adding special POS terminals in retail. The 2018 Vibes report discovered that 69% of respondents want to start using eWallets for their loyalty cards. No breaking news if we consider the stats above. However, what is really interesting is that the advocates of mobile payments are mostly women (81%) and millennials (89%). The former means that the companies that target mainly women should carefully consider digital loyalty programs. The latter signifies that in the future digital wallets will keep gaining momentum as long as millennials, the advocates of eWallets, become older. These figures prove that the market of digital wallets is growing and growing fast. 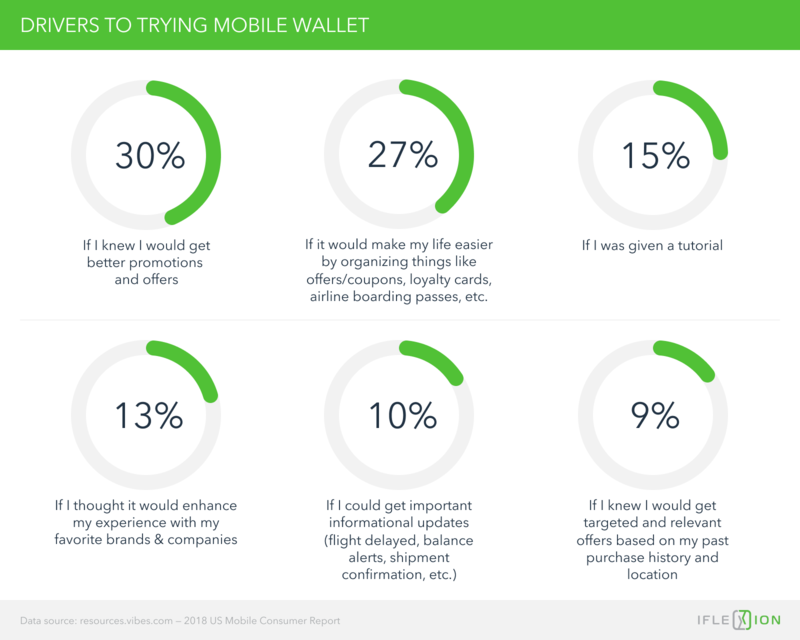 But what reasons make people switch to mobile wallets? There are at least 6 motivators for customers to start using digital wallets. A digital wallet is a convenient mechanism for aggregating credit and funds available across banks into one space. The traditional wallet, stuffed with cards and paper receipts, will gradually die out (although not right now). Smart watches can also have the eWallet downloaded to them. Customers don’t even need to have the phone with them. With some mobile wallets allowing customers to load up to 1,500 loyalty programs, they can manage all memberships, rewards, discounts, and vouchers in one convenient electronic space. Contact details are stored in the eWallet, so there is no need to go through a long process of filling in or updating personal data. This makes applying for a new loyalty program much sleeker. Customers don’t have to keep (or lose) loyalty cards and remember account details to participate in a loyalty program, which is convenient. There is no need to swipe two cards at the counter, or for the cashier to ask for a loyalty card. All that happens is that the phone (or watch) is tapped against the device — and the transaction occurs. This is good for both customers and the retailer. While in-store beacons can push special offers and discounts to customers’ phones, an eWallet can store them against the relevant loyalty program. The convenience that eWallets bring into purchasing makes them potential drivers of customers’ loyalty. And there is already evidence for this fact. Customers enjoy the ease of managing their loyalty programs using a digital wallet. Forbes claims that more than half of the US eWallet users expect to get functions other than payment, such as storing loyalty cards, coupons, boarding passes, receiving delivery updates and reminders. Perhaps exactly this diversity strategy made the Starbucks loyalty app so successful. The app mimics the functionality of an eWallet as it can be used to pay at the register. At the same time, it provides numerous perks, including reward points, gifts, discounts, preorders, seamless and free Wi-Fi sign-ins, and other free goodies, such as songs and games. As a result, the Starbucks’ app became the most popular restaurant loyalty app in 2018 and attracted 48% of such customers. At the JPMorgan forum in 2018, Starbucks CFO Scott Maw admitted that they saw tremendous growth in the last years, and almost all of their same-store sales growth was driven by the customers that had digital relationships with Starbucks or participated in the Starbucks Rewards program. The Vibes case is a good proof of the stats above that again shows that shoppers are ready to switch to digital coupons, bonuses, and other advantages of mobile wallets and loyalty apps. The two examples above show many merchants underuse a really powerful source for increasing sales. In brief, there are three key benefits of eWallets for retailers. 1. Digital loyalty cards are always with customers so they can’t forget or lose them. Some customers rarely shop, some customers are prone to spontaneous purchasing. With an eWallet, they don’t have to remember to take a card with them every time. They can just pop into a shop, decide to purchase, and still get the loyalty perks. Logically, eWallets prolong the period of participation in a loyalty program. 2. Marketers can use push notifications and reminders via eWallets to let customers know about sales, discounts, and time-sensitive offerings. How, when, and why does each customer engage with the brand? Do they shop in-store or online, or do they use both options? Do they use the catalog and discounts? Do they use the store as a showroom and buy online? Machine learning and big data increase the business advantages of eWallets. For example, facial recognition can help retailers assess the reaction to a particular promo or product. The insights based on a customer’s purchase history allow for creating special offerings, personalized recommendations, and in-store proximity alerts. The only limit to the information that merchants can gather is the understanding of what constitutes the invasion of privacy. The main pushback in adopting all these electronic conveniences is data privacy. However, the desire for personalized services play into the hands of merchants and stimulates customers to become less cautious regarding their data. The latest Vibes Mobile Consumer Report revealed that 87% of users would save personalized mobile wallet content in 2018 compared to 66% in 2017. 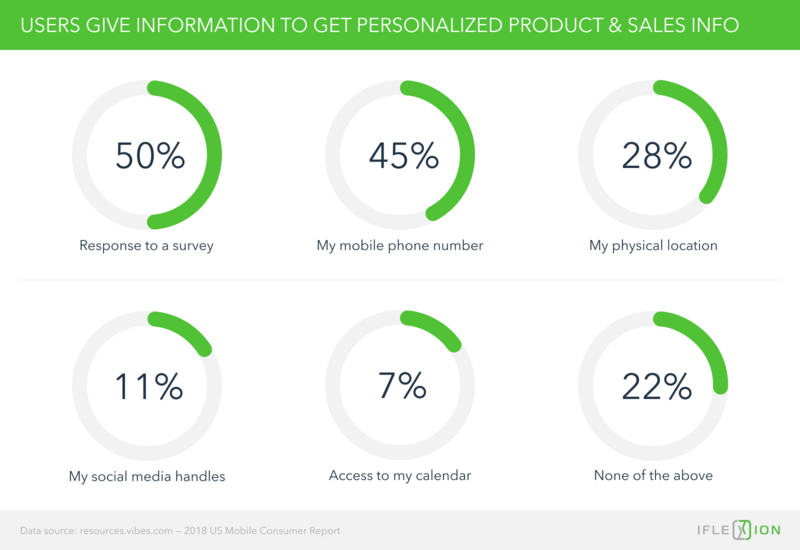 Most shoppers (78%) are ready to sacrifice some type of information in exchange for the access to personalized products or incentives. Though customers are most willing to give anonymous information, with responses to a survey being most common (50%), this data can be really helpful to tailor more competitive offerings. The same study shows that 45% of respondents can give their phone numbers, which is the start of a selling process for an experienced sales team. Millennials are much more open to surveys (56%) and giving their personal data, including phone numbers (54%), social media handles (19%), and calendar access (12%). So, what are the takeaways? Personalization is making people more prepared to disclose their personal data, and the trend will remain along with the growth of the younger generation. The growth of digital wallets would be even faster if there were no barriers — both psychological and technological. Vibes surveyed customers to find out the most common eWallet concerns. The most obvious threat is security (59%) as customers are afraid of losing their phones and wearables or having them stolen with all the sensitive data. This concern is not actually objective. All that it takes to keep private data safe is to ensure that both the phone and the app are pin-protected and that they can be disabled remotely. Such simple measures won’t let strangers access customers’ funds. Besides, many eWallets have robust security features that offer better protection than physical plastic cards. The second stumbling block which worries 19% of respondents is the lack of mobile-ready POS terminals. Though most smartphone models support the NFC technology needed for eWallets, many in-store POS terminals still can’t accept mobile payments. This means that eWallet users have to carry a backup system of cash and a card for cases where the store is not NFC-ready. The one wallet that is not restricted by this is Samsung Pay, which uses MST technology, as well as NFC to complete a transaction. This technology mimics a magnetic stripe swipe. It does not work for POS devices that request card insertion, however. This challenge requires making POS terminals NFC-compliant and places a burden on both banks and device suppliers. Merchants, in their turn, have to be informed and proactive in requesting the upgrade. While most (but not all) large retailers understand the need, many small merchants are still unaware of the benefits. Finally, if a retailer has not digitized the loyalty program to an omnichannel model, it is not eWallet ready. The merchant will have to invest in ecommerce development to ensure that customers can take advantage of the program and load it into the digital wallet. They also have to take care of the shopper who is not ready to move to an electronic wallet. If their reward program is being run by a loyalty management company, this should not be an issue, but many smaller retailers will be running a custom program and will need to upgrade their offerings. Despite the cons, an increasing number of merchants worldwide support and plan to support a variety of mobile payment options, the most common one being mobile apps for online shopping, mobile payments at POS, and special mobile payment options such as mobile wallets. In 2018, 29% of online merchants accepted mobile wallets, up from 24% in 2015 (Statista). So, upgrading stores for mobile payments is no longer an option to choose, it is a must to stay competitive on the market. As we discussed above, the situation is less urgent in Europe if compared to Asia, yet retailers don’t actually have much time to waste. In brief, the way to enabling mobile payment starts with allowing NFC in all of the brand’s stores. This may require an upgrade to POS machines and training the frontline staff to deal with cardless payments with ease. Behind the scenes, merchants should also take a good look at the current loyalty program and revamp it for a truly mobile experience. If the company has a loyalty program, is contemplating a loyalty program, or has no intention to ever start a loyalty program, this is a good time for introspection. Those who have a loyalty program that still requires cards and coupons, need to consider how to digitize it, remembering that some consumers will stick to the tangible program. New entrants are lucky enough to be able to leapfrog to a digital strategy from day one. Some merchants can have a compelling argument as to why a loyalty program is not for them (for instance, they have 1 to 10 customers or customers have no alternative). They could still benefit from a service feedback app. A good idea is to have a look at the loyalty programs in which you are personally enrolled — maybe there is a strategy for you in the mix. The introduction of eWallets has given customers the ability to subscribe to new programs without the overload of managing points, discounts, and other features manually. Digitizing the program will lead to more new subscribers. This is the time for retailers to review their target audience and whether the offerings are attractive to everyone. This requires building different profiles based on customers’ age and lifestyle. Retirees and millennials are looking for different benefits and experiences, and they are ready to give away different portions of information. Disappointing results of a promo campaign are just the sign to revisit the customer engagement model. Developing a smoothly performing eWallet or digital loyalty app that can simultaneously increase the company’s revenue and enhance shopping experience requires a lot of experience in software development and tech-driven performance improvement. That is why it is advisable to leave this to experts rather than burden the in-house IT department with the responsibility. The key is to look for a company that has experience in mobile-application-development, even though a mobile app is not necessarily needed to drive the loyalty program. With eWallets and loyalty mobile apps, retailers can stop wasting customers’ time at checkout. For sure, there will be a period when merchants will have to educate customers and motivate them to try a new form of relationship with the brand. However, the case studies above show that eWallet app development is worth the effort: as a result, the company will improve customer and employee experience, increase loyalty, drive sales, and stay competitive in the turbulent environment. The stats we reviewed today prove that delays in going mobile can cost merchants a lot more than investments in their loyalty and digital payment apps. In the end, the competition for customers’ hearts and purses is a race, and the better prepared you are, the quicker you reach success. The customer is ready to buy from your online store. They proceed to the mobile checkout just to see that their finger and the button "purchase" were never meant for each other. Oops. Here, we are not going to discuss more ways to screw up. Instead, we'll share our best practices for mobile checkout optimization to avoid customer churn at the last stage of the purchase funnel. This is the winning essay by Kasumi Higewake, chosen from 50 entries submitted for consideration in the Iflexion Scholarship Program throughout 2017. Follow us for more news on the upcoming tuition funding opportunities. Facebook's mobile app development tool is popular, but is it good? Here are the pros and cons of React Native for cross-platform app development.